Observation - Micro Moth - UK and Ireland. 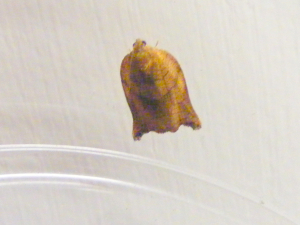 Description: Small brown moth attracted to light. distinctive wing shape when at rest (like batman's cape in the comics). V shaped marking across centre of wings. Small brown moth attracted to light. distinctive wing shape when at rest (like batman's cape in the comics). V shaped marking across centre of wings.